The hit movie Crazy Rich Asians will still be the talk of the time for months to come, especially now that even engagement rings and wedding jewellery are inspired by it! 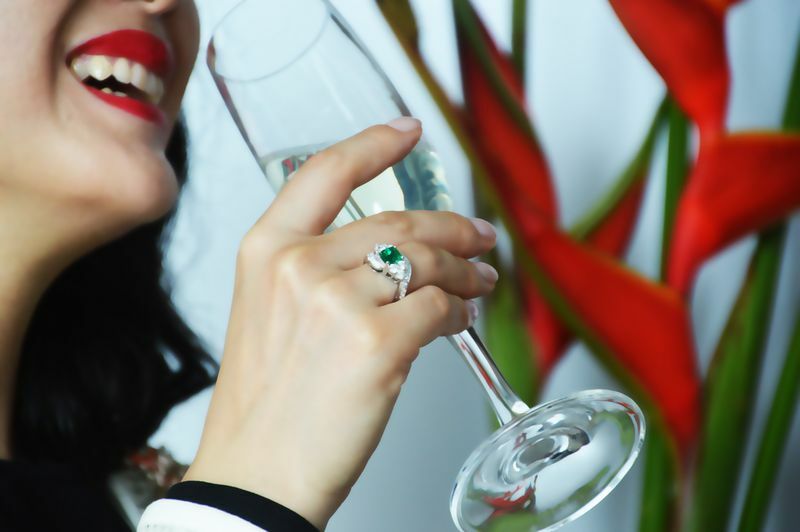 Paris-Hong Kong-Singapore based French fine jeweller, L'Excellence Diamond, made our cinematic dream a reality by presenting their emerald jewellery collection that includes an array of engagement ring designs and emerald earrings for your wedding day accessory. If you're thinking of opting for something other than the classic diamond solitaire ring, this gemstone is the perfect option. Green is becoming the new black, for modern and chic couples to stand out! The mesmerizing colour and sophisticated design of this emerald collection, skilfully selected by expert gemmologists and crafted with French artisan savoir-faire, is the answer to your prayers for a show-stopping, but effortlessly elegant wedding jewellery. Of course, this beauty comes with a story. It is known that emerald is Queen Cleopatra's favourite gemstone. How can it not be? The emerald is said to be a symbol of bliss and harmony in a relationship, a heart-warming message to send as your partner says "yes"! When it comes to quality, this collection by L'Excellence shouldn't be questioned. Every step of the process from the selection of the gemstones, the jewellery design to the final touch is meticulously carried out by the family enterprise that's been proudly standing from 1950. The subtle glistening shine of the gemstone and the intricacy of the design are the result of the company's long-standing French craftsmanship expertise that perfects every detail for the ultimate uniqueness of each jewellery piece. Contrary to popular belief, this gemstone of strong character suits any colour of your liking. In fact, the jeweller completed this collection with 3 different shades of gold: rose gold, yellow gold and white gold. The glamourous, exotic gem is a powerful statement to your wedding look, not to mention the unique symbol it carries. Scroll down to take a closer look to this fabulous collection and pick your favorite one!